It's easy to miss, but the people of Pokémon Omega Ruby and Alpha Sapphire whisper about things. Incredible things. Inexplicable things. The sorts of rumors involving legendary Pokémon that sound unbelievable, until you remember you're dealing with a video game, where there is no such thing as a tall tale. When I was a kid, 2003's Pokémon Ruby and Emerald were my favorite entries in the series. I remember spending days solving mysteries that would hopefully lead me to Pokémon I wasn't sure actually existed. It was the sort of suspense and wonder that no Pokémon game has been able to surpass—the only time in all my years playing Pokémon that obtaining a rare legendary Pokémon felt genuinely special. Why? Well, I got to pretend I was some sort of Pokémon archeologist who got to dig into ruins, and discover all sorts of secrets. The world of Pokémon felt alive to me. It's strange, looking back as an adult. I now know that the Hoenn generation of games weren't exactly well-received by the public, thanks to a poor selection of available Pokémon and an overabundance of water adventuring, among other things. As much as I was overjoyed to hear that the developers at Game Freak was remaking this generation of Pokémon games, there was some fear attached to the announcement. What if I revisited the games, only to find out everyone was right—Ruby and Sapphire aren't actually as good as I remember? Don't misunderstand, it's not that I care about being wrong. It's more that I didn't want to ruin a tender memory. I didn't want to find out that everything I loved about an old game was just nostalgia. Thankfully, no such thing happened. Omega Ruby and Alpha Sapphire are solid Pokémon games for fans and newcomers alike, thanks to many elements that make the entries shine among other major Pokémon games. Funnily enough, the things that make the games stand out are just as much the modern additions offered to make life as a Pokémon trainer easier, as they are the cool ideas the older games already had. Let's start with the first thing that people will notice while playing the game, though: the graphics. While the bulk of the game remain the same as the originals, at least layout-wise, being able to see everything in 3D, sometimes literally from new angles, makes the game feel new. It helps that there are now so many dang Pokémon in the franchise; it's impossible to feel bored when there are over 700+ Pokémon to raise, breed and collect, all with their own elemental strength and weaknesses you have to keep track of. The game manages to strike a balance between awesome Pokémon, and completely doofy ones, too. 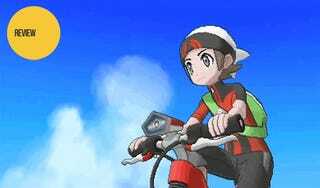 Still, Omega Ruby and Alpha Sapphire won't feel like a reinvention for the franchise, as last year's Pokémon X & Y did. While ORAS adds many of the joys of modern Pokémon games, like being able to pet your Pokémon through a feature called Pokémon Amie, and and it lets you do things like be able to seamlessly connect to other players around the world with just a few taps, you're still, as always, commanding a team of six pocket monsters in easy turn-based battles. There is depth to be found in the combat system, it's just not the sort of thing you experience in the single-player, where you'll probably overlevel a Pokémon enough that you don't have to think about their elemental affinities and weaknesses anymore. The game will feel familiar if you've ever played a Pokémon game before. The structure is exactly the same. You train your Pokémon so they get strong enough to face off against mini-bosses at things called 'gyms.' Beating these gyms lets you obtain badges, and once you beat all eight gyms/collect all the badges, you can challenge a league of master trainers called the Elite Four. What's different this time is the premise. Pokémon X & Y introduced us all to mega evolutions, those temporary power-ups that transform Pokémon into more badass versions of themselves. You'll find the special stones that activate mega evolutions in ORAS often, thanks to the ever-expanding list of Pokémon that can now mega evolve. But, in addition to megas, ORAS introduces the mysterious concept of primal reversion. Primal reversion, similarly to megas, temporarily power up and transform a Pokémon —only in this case, the Pokémon reverts to a prehistoric version of itself. Your primary goal is to become the best there ever was, but as you go along, the game sometimes poses questions like, what were ancient Pokémon like? Can the Pokémon of legends be restored to their former ancient glory? While there aren't many Pokémon that can undergo primal reversion, I consider it a more interesting mechanic than mega evolutions, partially because the lore already supports it. We know there are prehistoric, ancient Pokémon—every Pokémon game hides fossils which the player can bring back to life. Players have even come up with wild theories about how certain ancient Pokémon turned into newer Pokémon over time. Primal reversion feels right. Your encounters with primal reversion will primarily happen thanks to either Team Aqua or Team Magma, depending on which version of the game you get. Both Team Rocket-esque villain groups want to revive an ancient Pokémon in the hope of transforming the world through their power. While the version-specific enemy is neat, and while primal reversion is a natural addition to Pokémon, these elements feel somewhat underwhelming. The game never meaningfully explores primal reversion, lore-wise, and the villains are written with the sort of simplicity you'd expect out of a children's game. Worse, because the game is a remake, even with the modern tweaks to the mechanics—like giving players experience when they capture Pokémon—it can still feel like somewhat of a slog to play through, at least when compared to the brisk, punchy pace of X & Y. Other returning features such as contests don't meaningfully add to the game beyond giving you a cool Pikachu that can wear clothes. At first, this special Pikachu was cute. Eventually, I put it back into storage, replacing it with a monster I liked more. It's hard to get much mileage out of a feature that only one Pokémon out of hundreds can enjoy. All of this to say, the game isn't as perfect as I thought it was, even with modern improvements. I still think it's worth playing, though. One of my favorite new mechanics is the DexNav, a special app on your Pokedex which allows you to survey your location for Pokémon. The app will tell you what Pokémon you can capture on any given route, and it'll helpfully tell you once you've captured everything on that route. The DexNav also highlights special hidden Pokémon. Though it requires the time-consuming task of gently pushing the circlepad so your character carefully tip toes, you'll want to capture these Pokémon anyway. Not only will they have better stats than normal Pokémon, they'll also come equipped with unique moves, abilities, and items. The more you use the app, the more the search function will level up, and the rarer the Pokémon in the given area will become. It's the sort of feature that transformed the way I play Pokémon. Normally, I ignore most of the Pokémon that I come across, sticking only to the ones I know are my favorites, or ones that I know are strong. But because of this feature, I was enticed to capture pretty much every Pokémon I came across, often multiple times, in the hopes that I would find something powerful and special—yes, even Pokémon I knew were useless in battle, or that I actively disliked. I've always considered "gotta catch em all" to be a silly motto, the sort of thing I'd never actually do in a game, no matter how much a game encouraged me to try. And sure, I'm nowhere near completing my Pokedex, but this is the closest I've come to doing it. I genuinely felt as if I was exploring the world of Pokémon , not just for the sake of becoming a strong trainer, but also to learn more about the Pokémon themselves. Pokémon Omega Ruby and Alpha Sapphire may not look like it, but they're a different sort of Pokémon game. They're gentler, somehow. Many of the towns are kind of small, and the overall world doesn't have the sort of city-slicking bombast that games like Pokémon Black and White or Pokémon X & Y do. Your rival is a meek, sick child. You do your best to walk lightly, so you have a chance of capturing Pokémon in the wild without alerting them. 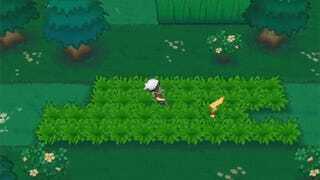 You notice smaller details like how the grass sways in the wind, or how aviary Pokémon fly overhead, in packs. Whenever you do something, seemingly everyone hears about it—an app on your Pokedex reveals that tiny things, like a Pokémon you once caught, is the sort of thing that will be broadcasted on the national news. All of these combine to give the game a sort of small-town feel, but don't be fooled. There's more to Hoenn than it lets on—but the only way to discover this is through exploration. Through clever usage of Pokemon moves like "surf" and "dive," as well as bikes which change the way the player traverses through the terrain, Pokemon lets trainers with a keen eye reach locations that are otherwise invisible at first glance. Exploration feels like it's at the heart of this Pokémon entry, really. It's not just hidden Pokémon. The world hides tons of little secrets, from items, to underwater pathways, to nooks and crannies where players can build their own bases. These bases, which are a returning feature from the original games, can be decorated with all sorts of plushies and knickknacks, giving the game a sort of Animal Crossing feel. Better yet, players can treat bases as pseudo gyms, complete with puzzles and battles for friends to experience. While playing, I couldn't help but seek out as many potential secret bases as I could. Heck, I found myself spending the bulk of the money I acquired from battles on secret base decorations, all the the hopes of constructing the cutest, coolest little clubhouse I could. My only complaint is that the secret bases feel small, and there's a limit to how many items you can place inside of them. In my perfect world, bases are huge and I can fit a plush of every single Pokémon available. Yes, all 600+ of them. No, this isn't realistic. The soul of the game, exploration, is what lends legendaries so much potency in ORAS. I mentioned this before—what I loved about the original games is the sense of awe and wonder I got while hunting legendary Pokémon. The newer games nail this, too. While I think that Pokémon games have added too many legendaries over the years, the ones in Omega Ruby and Alpha Sapphire remain stand-outs. If you want to get all of the legendaries included in the original games, you're going to have to work for it. You're going to have to explore and become well-acquainted with the world. You're going to have to pull a notebook out and decipher some puzzles. You're going to talk to everyone, in the hopes that you get some clues about a legendary you're hunting. The world of Pokémon Omega Ruby and Alpha Sapphire feels rich with mysteries and things to discover, and this is why I cherish them so much. Admittedly it feels like the game comes close to ruining this, thanks to the incredible number of legendary Pokémon you can acquire overall. Between both Omega Ruby and Alpha Sapphire, it's possible to capture every single legendary Pokémon released in all the games thus far. There are dozens of 'rare' Pokémon in the game. What saves the game from feeling as if it goes overboard is that, in order to do this, you have to hop onto a Pokémon's back and fly through the world in search of anomalies on the overworld map. These anomalies hold legendary Pokémon, but that isn't important. What's remarkable for me about this feature the view: it's gorgeous up there. As a kid, I could only dream of what it would feel like to experience the world of Pokémon like this, and embarrassingly, being able to do it as an adult made me a bit teary-eyed. I just wish the game gave players the ability to soar the skies like this earlier in the game. Thankfully, the mechanic finds plenty of use once you actually beat the game,and many of the post-game parts of ORAS open up. Unfortunately, because of embargo rules set by Nintendo as a condition for reviewing the game prior to release, I can't be specific about the incredibly exciting things that happen once you beat the game. Suffice it to say that players will find a ton of things to do once the main story is done—there are many Pokémon to collect, new places to battle, mega stones to find, and story things to tackle. The latter is of particular note, as the game sheds new light on the story in ORAS, as well as other Pokémon games. I'm looking forward to seeing what sorts of wild theories the revelations featured in the post game elicit from Pokémon fans. We'll have more on that once the game actually launches. When Pokémon fans talk about the Ruby and Sapphire, they like to reference trumpets, a strong, memorable instrument featured heavily in the soundtrack of the original games. They make some appearances in the updated soundtrack, too. I didn't really "get" the meme the first time around, thought it was just a weird joke that players latched on to. But now, after re-experiencing the sense of wonder fostered by Ruby and Sapphire, and after having the opportunity to soar through the skies on the back of a legendary Pokémon, I get it. The spirit of Omega Ruby and Alpha Sapphire can be heard in the trumpets, the trumpets sound a hell of a lot like triumph.